Graduates of the First Nations Tax Administration certificate program from the Tulo Centre of Indigenous Economics and Thompson Rivers University have a competitive edge. The certificate program offers skills based courses in First Nation Taxation, Establishing Tax Rates and Expenditures, Property Assessment and Appeals, Tax Notices, Collection and Enforcement, Communications, Service Agreements, Development Cost Charges and Capital Infrastructure Financing. Whether you wish to advance your career or join this rewarding profession, we encourage you to consider this program. First Nation Tax Authorities will reap the rewards of hiring a graduate of the Tulo Centre of Indigenous Economics. The FNTAA and Tulo Centre of Indigenous Economics share the common objective of building tax administration and economic development capacity for First Nations and elevating the professional standards and ethics representing the First Nations tax administrator profession. FNTAA and Tulo have signed a Memorandum of Understanding stating our mutual commitment to ensure curriculum development for the tax administration program is of high quality and relevant to tax administrators. 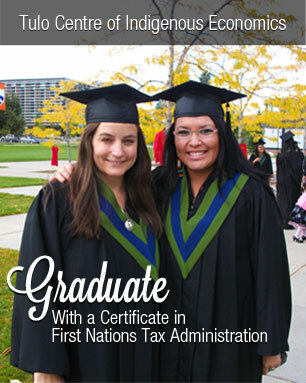 Successful completion of the First Nations Tax Administration certificate program is a prerequisite to becoming a Certified First Nation Tax Administrator.